Chris Davis: Too Good to be True? On Tuesday, Matt Kremnitzer over at Camden Depot took a look at the hot start to the season for Chris Davis, and came to the conclusion that his early season success can be attributed to his improved plate discipline. Kremnitzer has a similar table in his piece, but take another look to see just how much Davis’ approach at the plate has improved so far this year, compared to his previous time with the Orioles (updated numbers for 2013). Currently, Davis is sporting a triple slash line of .337/.438/.704, with a .467 wOBA (as of May 3rd). Is he going to keep that up during the entire season? Absolutely not! But, as Kremnitzer pointed out in his piece, his improved approach at the plate is a very positive indicator that Davis has a good chance to continue his success over a sustained period of time. However, before we start talking about Davis as a potential MVP candidate, there are some reasons to be skeptical of his hot start. I bring this up not to be a “Debbie Downer”, but more to temper expectations. The first (and easiest) indicator is with Davis’ BABIP, which is a lofty .387, despite a line drive rate that is currently a career low and roughly 3.5% below his career rate. To put this into perspective, typically batters who hit a lot of line drives and/or are fast can sustain a high BABIP. For example, Ichiro Suzuki has a career .347 BABIP, and Dexter Fowler (who is speedy) led the league in BABIP last year with .390. He also happened to lead the league in LD% at 27.2%. Davis is nowhere near as fast as Fowler and currently has a LD% of 19.7%. However, the career BABIP of Chris Davis sits at .338, so even a regression to his career level won’t send his overall numbers off a cliff. This is the good news. Now here comes the bad news. Chris Davis swings at fastballs down and in…and crushes them. 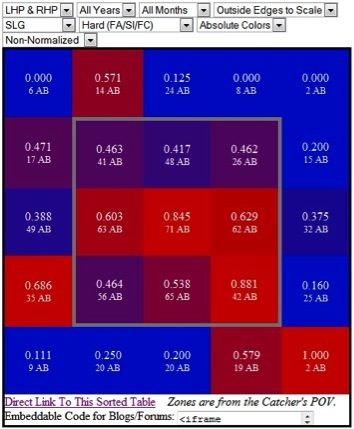 Check out the figure showing his SLG on fastballs over his career by zone, courtesy of Brooks Baseball and Baseball Prospectus (from catcher’s point of view). You may say that’s not bad news, or even that it’s not news at all, but it sets up the bad news. And that is that Chris Davis also swings at pitches that initially look like meaty fastballs down and in, but turn out to be breaking balls (curveballs and sliders) that dart out of the strikezone. As a result, he DOES NOT crush them, and often times he misses them completely. This time, our trusty figure shows his swing rate on breaking balls, again from the catcher’s point of view. Pay special attention to the highlighted area out of the strikezone in the bottom right corner (pitches down and in to Davis) and make a mental note of how many times he swings at breaking balls there. 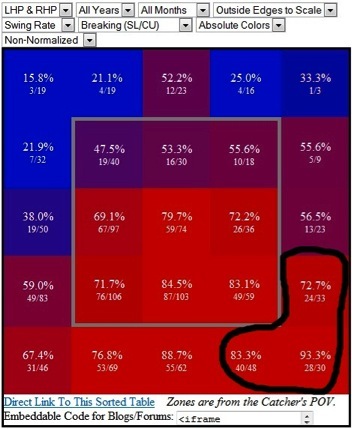 Now combine that swing percentage with the fact that he whiffs on breaking balls in that area more than 53% of the time (and 71.4% specifically in the zone on the bottom right). Breaking balls thrown out of the strikezone down and in to Chris Davis is an undeniable weakness. For some reason, opposing pitchers haven’t thrown Davis many breaking balls down and in out of the strikezone this year. I’m not sure why they wouldn’t throw breaking balls in that area with more frequency, other than the fear of making a mistake and getting punished (Davis will crush breaking balls that don’t find their way far enough inside). Another potential reason could have something to do with the batters in front of Davis consistently getting on base, requiring pitchers to guard against the steal or a passed ball. A pitch down and in to a left hander is a difficult spot for a catcher to receive, especially when trying to throw out a potential base stealer. Chris Davis is off to an amazing start to the year and there are good reasons to believe that an improved approach at the plate is a bigger reason for it than plain old luck. As the season progresses and pitchers throw more breaking balls out of the zone down and in to Davis, we’ll see if that improved approach includes laying off those pitches, giving us a better idea as to whether Davis is going to have another breakout year. This entry was posted on May 4, 2013 at 1:07 pm and is filed under Offense with tags BABIP, Camden Depot, Chris Davis, Small Sample Size. You can follow any responses to this entry through the RSS 2.0 feed. You can leave a response, or trackback from your own site.